Becca Beach Tint: Dragonfruit vs. Watermelon. First of all I want to apologize for not posting very often on this blog lately. I do promise I will try to keep up with it since I have a lot of things I want to share with you. 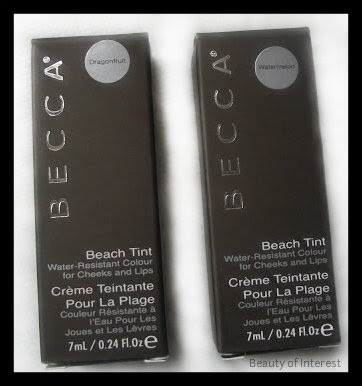 This will be short comparison post on the Becca Beach Tints. For those who didn't know Becca came out with 3 new Beach Tints recently and one of them is Dragonfruit. 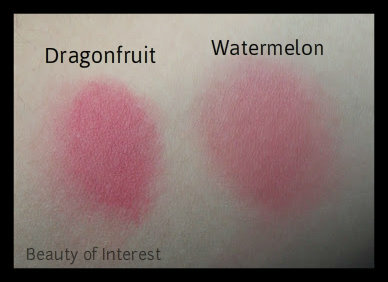 A lot of people have been asking if Dragonfruit is simular to Watermelon (a shade in their permanent range) so this post will hopefully give some more insight in these colors. But before we go on maybe a little more info about these Beach Tints would be in order. 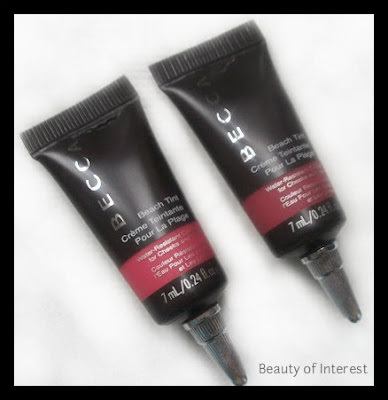 The Becca Beach Tints are described as 'water-resistant crème stain' that can be used on the lips as well on the cheeks. They come in a little squeeze tube of 7ml/0.24 fl. oz as you can see on the pics above. I personally don't wear them a lot on the lips because I do find them to be a little drying. But I absolutely love them on the cheeks. Texture is very creamy, easy to blend, light weight and it stays on all day on my combo-oily skin. No need to explain further that this is a brilliant product. A little note of warning: not all the shades are equally pigmented so I do suggest to test them out before you buy them. Back to the original purpose of this post now. Dragonfruit and Watermelon are not simular at all. Dragonfruit is a cool bright pinky shade compared to the more warmer rosy color that would describe Watermelon. A picture says more than a thousand words so I did some swatches to show the difference between these 2 beach tints. They retail for $25 USD or 25 EUR if you're in Europe so they are a bit pricey for the amount that you're getting. But you only need a tiny bit so 1 tube will last you ages and you really are getting your money's worth with this product. The Becca Beach Tints can be found in the Becca stores and counters and can also be purchased online on their website.